Although the last day of Fall and the first day of Winter were perhaps not the most inviting choice for touring, the bleak scenery was still beautiful. In the 1700s, as European settlers were expanding westward from the east coast of the fledgling America, the indigenous Native Americans became increasingly displeased. Some tribes had sold their land for next to nothing, while misleading treaties and broken promises had cheated others. Many more were simply forced away by colonial militias. Not surprisingly, a number of tribes chose to fight back. The resulting attacks on outlying farms led many settlers to build “fortified houses,” designed to withstand such raids. These houses were typically made of stone, with secure basements—preferably with a spring for drinking water and rifle slits for defense. My principal goal for the trip was to see if some of these old forts still existed. France provided weapons to the Indians in an attempt to impede the English settlements, setting off the French and Indian Wars in 1754. During this period, many settlers moved back east. After the cessation of hostilities in 1763, the pace of settlements reaccelerated. The Annefield plantation house was built in 1790 and is quite imposing even by modern standards. In 1808, Mary Lee Fitzhugh (Mrs. George Washington Parke Custis) was traveling by coach when she went into labor. She stopped at Annefield, and delivered a daughter shortly thereafter. Said daughter, Mary Anna Randolph Custis, went on to study Latin and Greek, edit a volume of her father’s writings about his adoptive father, George Washington, and marry Robert E. Lee in 1831. Next up was a dwelling known as “Homespun.” I was expecting to find its ruins but was pleasantly surprised to discover that it has undergone a comprehensive renovation and recently opened as the Coach & Horses Tea Room. The frame portion on the right was built sometime in the 1790s by German immigrant Godfrey Miller, while the stone portion was added in about 1825 by his son John. Homespun served as a hospital during the Civil War—probably a very busy one, in view of the almost continuous action that occurred in this area. But what about the fortified houses, you ask? Well, feast your eyes on Fort Colvin, which is situated about 4 miles from the center of Winchester. It started out as a springhouse, built by the earliest Scots-Irish settlers in this area no later than 1750. It borders Opequon Creek and sits directly above a small spring. By 1755, nearby Indian attacks prompted Joseph Covill to move into the springhouse from his property on the other side of the creek. Somewhere along the way, one corner of the house collapsed, and the stone wall was replaced by a wood frame section incorporating a porch. Fort Colvin now rests rather incongruously among the modern mansions of the Stonebrook Farms residential development. The house and its 2 acres of land are for sale in case you have an appetite for history (and a spare $99,900). The settlement along Opequon Creek was prompted by Virginia Governor William Gooch’s efforts to protect his colony from incursions by French settlers from Ohio and their Native American allies. He awarded large land grants west of the Blue Ridge Mountains to agents Jost Hite, Robert McKay, and others, who in turn sold property to settlers at low prices. Taking advantage of this opportunity, Samuel and Mary Glass left their native County Down, Ireland, and came to America in 1735. A year later, they established their “Greenwood” homestead near the headwaters of the creek, in what is now the town of Opequon. Unfortunately, Greenwood was destroyed by fire in 1943, but many other Glass properties have survived. 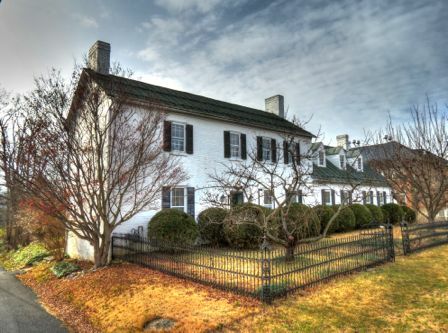 Samuel and Mary’s son Robert built a 1½-story fortified limestone house in 1755, naming it “Long Meadow.” A log cabin was added soon after, and a 2-story stone addition with stucco exterior was completed in 1827 by grandson Robert David Glass. All three of these structures have survived and can be seen in this photo, with the original limestone section on the right. As I was turning the 335i around, I noticed this old fireplace and chimney surrounded by small trees. I later learned that it’s all that’s left of a log cabin on the Long Meadows property. It was built in the first half of the 1800s and probably served as a slaves quarters. Robert Glass also built another log dwelling in 1797, which was greatly expanded by his son Samuel and grandson Thomas. “Rose Hill” was completed in 1819 and has been a working farm ever since. In 1862, Stonewall Jackson’s famous Shenandoah “Valley Campaign” began with the First Battle of Kernstown, with some of the fiercest fighting occurring at Rose Hill. As a historical footnote, the First Battle of Kernstown was the only defeat ever experienced by Stonewall Jackson. The rest of the Valley Campaign was a series of stunning victories, and Jackson’s brilliant strategy and tactics continue to be studied to this day. Although the day was cloudy and very cold—24 degrees so far—I was enjoying driving the faithful 335i over a multitude of rural Virginia roads. It’s almost amazing how well this car corners and how strong its engine is. And the climate control system and heated seats were getting a good workout as well. Speaking of “bleak houses,” check out this abandoned brick structure just outside of Opequon. It appears to date from the second half of the 1800s and could still be rescued. Joseph Glass II, grandson of Samuel and Mary, built this gristmill in 1812. Its limestone walls are 3 feet thick at the base, and all three floors are made of chestnut oak beams 50 feet long. Although the water wheel has been removed, much of the original milling equipment is still present inside. Note the chimney at the top of the mill: its flue actually starts in the adjoining frame office and is connected by two diagonal doglegs that bypass the windows. Somehow, it all works well. The mill continued in operation until World War II and is now a private residence. The oldest structure in Opequon is called Race Mills or the Glass-Rinker House. The original 1½-story building (shown on the right) dates to 1751, when Samuel and Mary Glass deeded land to their son Joseph. Brother Robert probably contributed his stonemason expertise to its construction. As best I can tell, a small mill was added at the southern end of the property (out of sight in the photo) later in the 1700s, but it was destroyed, leaving only the foundations. (A residential addition was built on these foundations in the 1950s.) Joseph Glass II added the prominent 2-story stone section in 1812. The Mini Cooper apparently came later. Leaving Opequon, I continued to follow Cedar Creek Grade southward. While taking this photo of Cedar Creek and its mid-stream boulders, I suddenly realized that I’d been here before—and that there was another fort nearby. The Asylum, the Poorhouse, and Other Tales of West Virginia has the specifics; I’ll just mention that this unusual, hexagonal icehouse extends roughly 20 feet below ground. It is known as Stephens Fort, and it was here that Lewis Stephens and his family would take refuge if hostile Indians were in the area. By now I’d been on the road for 3½ hours, and I was nowhere near the official start of my tour—namely, Fort Valley, VA. Determined to make up for lost time, I promptly detoured to find the scenic old Stoner-Keller Mill on Tumbling Run in the village of Fisher’s Hill. Frederick Stoner built the gristmill in 1772, with its fourth story added in 1855. The mill was somehow overlooked during the infamous Union “Burning Campaign” during the Civil War, and operations continued unimpeded until it closed in 1958. Unfortunately for my schedule, I noticed that the mill is located on Battlefield Road… Yep, the Battle of Fisher’s Hill took place nearby in 1864, when what was left of Confederate General Jubal Early’s army retreated here after its defeat the day before at the Third Battle of Winchester. Fisher’s Hill was a natural fortress, with 4 miles of mountain ridge protected by rugged terrain. It was called “America’s Gibralter” and was considered unassailable. Early’s exhausted troops dug in quickly, expecting an imminent attack from Major General Philip Sheridan’s Union forces. A portion of Fisher’s Hill has been protected as a historic battlefield. It was peaceful and quiet on the day of my visit, without another person in sight, and I had trouble imagining the desperate struggle that took place here 150 years and 3 months earlier. In his battle report, Gen. Sheridan took credit for the plan to attack Early’s left flank. Gen. Crook protested vehemently, Sheridan refused to acknowledge Crook’s role, and the 40-year friendship between the two men was over. One of Gen. Crook’s top commanders, who was wounded on four separate occasions in various battles, was Colonel Rutherford B. Hayes. He was elected President of the United States 13 years later. After leaving the battlefield, I couldn’t help nosing around Fisher’s Hill a bit longer. Norfolk Southern is still using the railroad tracks that run by the town, but nothing stops at the old depot any longer. Nearby, both of these young cats were anxious to be fed and/or scratched. I didn’t have any treats with me, but I had them both purring in no time. I finally headed back in the direction of Fort Valley, stopping briefly in Strasburg to admire the old Spengler Mill (now the “Old Mill Grill” restaurant). It was built in 1794 and is believed to have escaped the Burning Campaign because the Union Army was using it to grind wheat. Being unable to help myself, I also sought out the Strasburg Christian Church (1872), the unusually ornate Mennonite Church (which had been the Strasburg School from 1910-1968), the Academy Hall school (1820), and the Strasburg Hotel (which started life as the town’s hospital in about 1880). Remarkably, Belle was cleared of any wrongdoing. But Union soldiers were posted at her house, and her movements were monitored. Belle flirtatiously befriended many of the officers, including Gen. James Shields, and found ways to pass important information to her contacts in the Confederacy. These activities soon led to her arrest and imprisonment, but she was released after only a week. In May 1862, she was visiting relatives in Front Royal, VA, staying at this cottage. (It is now part of the Warren County Heritage Society.) Her old acquaintance, Gen. Shields, and other Union officers had made their headquarters in her uncle and aunt’s nearby hotel. There, by listening through a knothole in the upstairs floor, Belle learned of their plans to trap and annihilate Stonewall Jackson’s army. At 1:00 AM that same night, Belle saddled her horse and rode 15 miles through the Union lines to find Confederate Cavalry Col. Turner Ashby at the home of a mutual friend. She apprised Col. Ashby of the Union plot and returned to Front Royal. The Union plan to trap Stonewall Jackson’s army was put into motion a few days later—and failed. Jackson and his army continued onward toward Front Royal, stopping briefly at the Asbury Chapel to consider the best topographical approach. This 1848 chapel was one of many named for Bishop Francis Asbury (1745-1816), who was a prolific evangelist throughout the early American frontier. Here, Jackson learned that the Union 1st Regiment Maryland Volunteer Infantry was defending the town. He promptly ordered his Confederate 1st Maryland Infantry to lead the charge “to show which were the best men and the truest representatives of Maryland.” In the process, the commander of the Confederate unit captured his own brother. Jackson’s artillery set up here at Prospect Hill overlooking Front Royal. Six years later, the Ladies’ Warren Memorial Association sought out the Confederate dead who had been buried at a number of sites around the county and relocated their graves to the Prospect Hill Cemetery. About 90 of the deceased could be identified, and their headstones form “Soldiers’ Circle.” Another 186 unknown soldiers were interred in a common grave in the center. Elsewhere in the cemetery, a bright garland added some much-needed color to the otherwise bleak view. Col. Kenly and his remaining forces regrouped on top of Richardson’s Hill, 3 miles away, at the “Fairview” home of Thomas McKay. There they bravely did their best to delay Jackson’s army, knowing that they would ultimately be defeated but vowing to protect the retreat of Gen. Nathaniel Banks’ army from Strasburg. They succeeded in their mission, but Kenly died from his wounds and his surviving men were all captured. The Battle of Front Royal was over. Stonewall Jackson continued his Valley Campaign to its successful conclusion. Belle Boyd continued her spying operations as well; all told, she was arrested at least 6 times, imprisoned 3 times, and exiled from the country twice. She was captured at sea while sneaking back into the country after the first exile, but she beguiled her captor, Union Navy Captain Samuel Hardinge—who promptly let her go free! (And we wonder why so many women manage to get out of speeding citations…) Capt. Hardinge was later court-martialed for his action—but later still married Belle Boyd in England. Belle’s enemies characterized her as “the fastest girl in Virginia—or anywhere else for that matter,” but many years later she stated on her deathbed that her virtue had remained intact throughout these adventures. By all accounts, she was one of the most capable and daring of the Civil War’s many female spies. On the other side of the South Fork of the Shenandoah, “Riverside” was built in 1847 by Samuel S. Spengler. Local history holds that Spengler lost his mansion in a poker game to the deputy sheriff of Front Royal, Major James R. Richards. Richards’ mother-in-law lived here during the Civil War, and her diary records that Stonewall Jackson stayed at Riverside on the night following the Battle of Front Royal, while Union Gen. Philip Sheridan roomed here in October 1864 during his infamous Burning Campaign. The stately home is little changed from its original construction, other than the addition of the two small brick wings in 1921. After visiting the Thomas McKay house, where Col. Kenly made his last stand, I drove back down the hill toward Fort Valley. However, my eye caught a historical marker referring to “The McKay House.” Puzzled, I stopped and found only the Green Valley Baptist Church. A more careful reading of the sign indicated that the Robert McKay house was somewhere to the west. I consulted the ever-helpful Google satellite map view on my iPhone, glanced around for any No Trespassing signs, and, seeing none, set off on foot to see what I could find. After struggling through a lot of failed wheat, tall weeds, and prickly “common teasel” flowers, I spotted the ruins of early pioneer Robert McKay’s house in the distance! I believe this smaller building served as a summer kitchen to the main house. The restored McKay House was occupied for many years, and a concrete block and frame addition was appended to the north side, but by 2004 the house was vacant once again. Warren County and the city of Front Royal bought the property, in part for its historic importance but primarily to serve as a buffer around the McKay Spring, which serves as a water supply for Front Royal. In 2009, sadly, a lightning storm started a fire, destroying the frame portion and severely weakening the stone section, most of which collapsed soon after. An iron brace was erected to stabilize the remaining east chimney and wall. The government co-owners have considered restoration of the McKay House, but I’d have to say that the odds are against it. This is all that’s left of the oldest house in Warren County (and possibly the oldest house in Virginia west of the Blue Ridge). Today, Fort Valley remains a scenic and historically interesting valley within the Shenandoah Valley. Fort Valley Road is the only entrance at the northern end. Once inside, the bordering arms of the Massanutten are visible in just about every direction. The Elizabeth Furnace operated in Fort Valley starting in 1836. I was planning to hike the modest 0.1-mile “Pig Iron Trail” to the furnace and back, but the trails aren’t well marked and I inadvertently found myself on the Tuscarora Trail—leading straight up the Massanutten and directly away from the furnace. I realized my error after half a mile or so and doubled back, which was a good thing since this trail winds on for a total of 248 miles! I eventually found the furnace ruins and learned that it had produced pig iron to feed the forges in Harpers Ferry. Iron from the furnace was used to produce weapons and ammunition for the Confederate Army during the Civil War, until Union forces destroyed it in October 1864. This convenient swinging bridge carries hikers over Passage Creek. The creek itself was scenic in a wintry sort of way and showed evidence of an earlier ford. The little crossroads hamlet of Seven Fountains features four current and former churches within a radius of about 500 feet. I’m not sure how that came about, since even Baptist squabbles don’t resort in so many competing houses of worship. The Dry Run Christian Church and Trinity Brethren Church were built in 1921 and 1904, respectively, while the little red brick church served five or more different congregations during 1830-1949. The latter two buildings are now part of the Fort Valley Museum. The land for the 1830 red brick church, incidentally, was donated by local farmer and distiller Daniel Munch. Munch’s hilltop house was built in 1834 and remained in the family until 1961. Gen. Sheridan’s Burning Campaign did not find its way into Fort Valley, so this farm was not torched. Daniel’s son, Silas Munch, was the only resident of valley to vote for President Abraham Lincoln in 1860; he had to flee to Ohio shortly thereafter for his own safety. With the sun setting behind me, I took this photo of the Luray Valley and South Fork of the Shenandoah River from the top of the Massanutten. The Blue Ridge Mountains are in the distance, and somewhere down there is the Mimslyn Inn, where I would be spending the night. After 10 hours of enjoyable BMW driving and touring, I arrived at the Mimslyn Inn, which sits on top of a hill overlooking Main Street in Luray. It opened in 1931 and benefited from a thorough restoration in 2005-2008. It appears to have changed very little over the years, other than losing a lot of ivy. I had a quick look around the inn before dinner, admiring the circular staircase and the cozy sitting room. Although I had opted for one of the relatively inexpensive “historic rooms,” I found that it was nicely furnished and very comfortable. Only later did I learn that my room was right next to Room 306, which is said to be haunted by the family that was supposedly murdered within. Numerous ghost sightings have been reported over the years, but (unfortunately!) I neither heard nor saw anything out of the ordinary. After an excellent dinner at the inn, it was time to review my plans for the next day and to get a good night’s sleep. Stay tuned for Part II of this tour, in which Yr Fthfl Srvnt drives unnecessarily fast, uncovers more abandoned buildings, scenic vistas, and little-known history—and, best of all, gets an inside look at a fortified house from 1760!